Critical Safeway Union Negotiations Meetings! Safeway workers are gearing up for negotiations with Sobeys. An integral part of that preparation involves meeting to discuss what needs to be changed and improved in the Union Contract, but also to talk about strategy. Together, we will strive for the best possible outcome and show the company that we are united and speak with one voice. 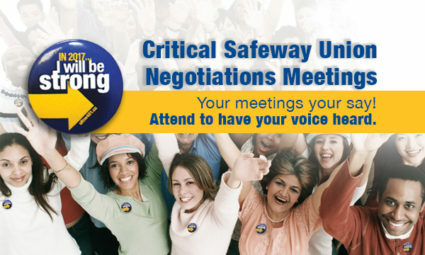 We look forward to seeing all Safeway union members at one of the upcoming strategy and proposal meetings in your area. Check them out!